Placentia, CA (November 19, 2018) – A man has been arrested following a road-rage incident where he intentionally struck a motorcyclist with his pickup. The incident occurred Monday November 19th in Placentia just after 6:00 P.M. The Placentia Police identified the driver as Michael Eugene Begin. 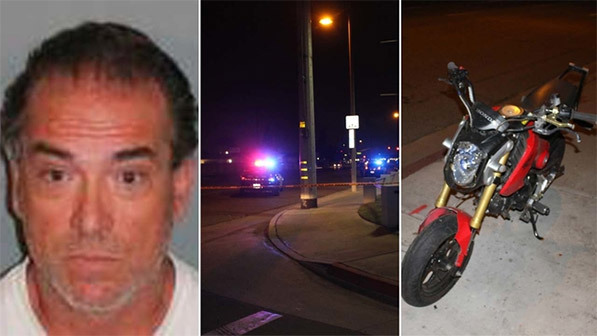 Begin was driving a dark blue Chevrolet Silverado pickup truck at the intersection of Orangethorpe Avenue and Hundley Way where Begin struck the rear tire of a motorcycle following a bout of road-rage with the motorcyclist. The rider was thrown off his bike and struck a wall on the north side of the street according to authorities. The motorcyclist was taken to the local hospital where he was listed in critical condition. Following the initial impact, Begin’s pickup continued until it hopped the curb onto the north sidewalk of Orangethorpe Avenue and hit a pedestrian. The pedestrian was transported to the hospital where he was treated for a broken leg. According to Placentia Police Department, Begin fled the scene instead of stopping and offering aid. Begin jumped onto the westbound 91 freeway and was able to evade officers. The following day Begin was apprehended at his job site in Laguna Woods after a witness wrote down the license plate to Begin’s blue Silverado and reported it to investigators. Begin was taken into custody and charged with attempted murder. If anyone has relevant information on this investigation please report it to the Placentia Police Department at (714) 993-8146.